HLB MEKONSULT has a thrilling opportunity for a motivated University graduate to join its friendly, supportive and learning team environment that will nurture your skills and significantly contribute to your professional development and career growth.We welcome applications from graduates in business related disciplines including Accounting, Finance, Taxation, Economics, Statistics, IT, Business Administration, Agribusiness and related courses. Additional specialization in education and psychology will be an added advantage. You will join the team that delivers audit, assurance, tax and advisory services.You will train with us for a period of one (1) year, working as an audit trainee. During this period you will be provided with stipend to sustain you, besides an opportunity to travel to upcountry as you attend our clients’ assignments. Successful candidates will be given employment contracts with an attractive remuneration package at the expiration of the program. This is an incredible opportunity for a graduate to take their first step in their career development and growth. Join the ever growing Organization and feel the growth in knowledge and experience. Start the journey of your career by joining us. Successful candidates are expected to start the training on 1 October 2016. We are an international professional services firm based in Dar es Salaam, Tanzania - providing audit, assurance, tax, risk management and other advisory services.Resourced by full time staff, consultants and associates from the industry, the firm is committed to pursuing the highest levels of integrity, quality and professionalism in delivering a broad inventory of professional services to its clients.HLB MEKONSULT team is made of multi-disciplinary and multi-national personnel to provide its clients with excellent professional services. The firms’ international affiliation with HLB International (visit www.hlbi.com) equips it with a blend of expertise and experiences from different business cultures in the world, enabling it to provide its clients with value added professional services. 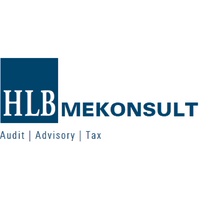 For more information about HLB MEKONSULT visit www.mekonsult.co.tz. Send your resume to jobs@mekonsult.co.tz. Don’t miss out – Apply by Apply by 31 August 2018.